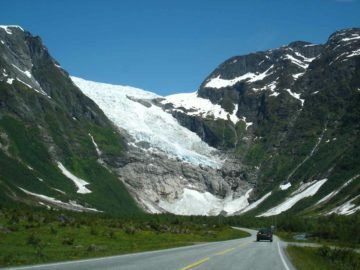 More og Romsdal (more accurately spelled Møre og Romsdal) probably had the most dramatic scenery of Fjord Norway of all the counties we encountered during our June-July 2005 visit to the country. 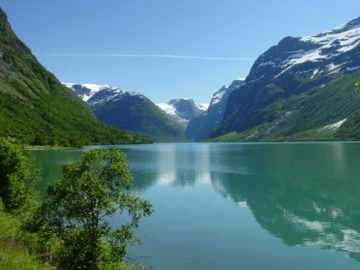 The county featured perhaps the most famous and magnificent of the country’s fjords in the Geiranger Fjord (Geirangerfjorden), which also featured the Seven Sisters Waterfalls, abandoned farms with rich history, and a bunch of other waterfalls both thick and thin. 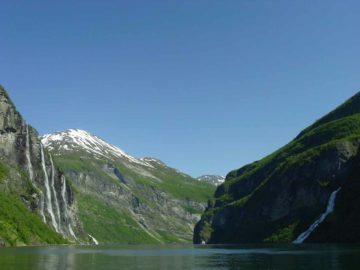 In fact, I think in the Disney movie Frozen , Arendelle could very well be an animated version of Geirangerfjorden. 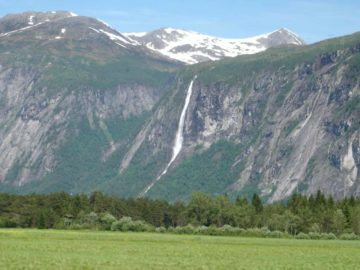 The county also featured the steep-walled Romsdal Valley (Romsdalen) that I thought was very much like a Norwegian counterpart to the incomparable Yosemite Valley. 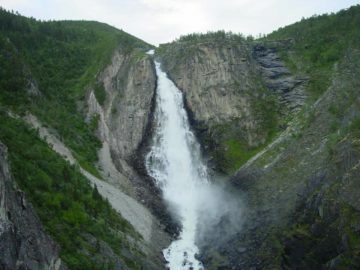 There were numerous waterfalls that we encountered in Romsdalen, including Vermafossen and Døntefossen. 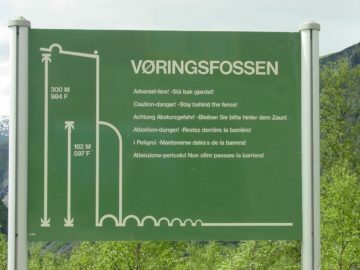 Moreover, Romsdalen featured very tall mountain and cliff formations like Trolltindane and Romsdalshorn, which was kind of how Yosemite featured cliff and rock formations like El Capitan, Half Dome, and many others. 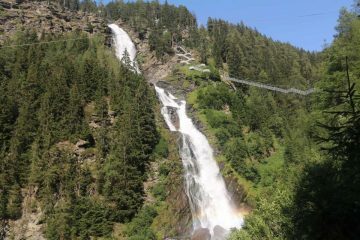 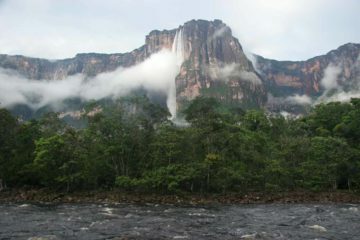 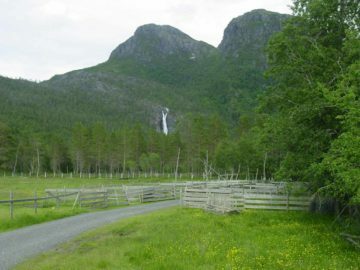 Amazingly, that wasn’t the only waterfall-laced valley we visited in the county. 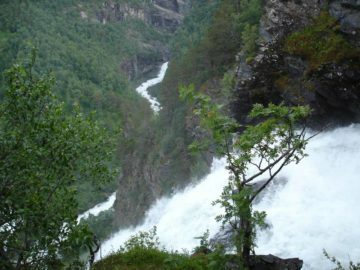 Indeed, we also passed through Sunndalen Valley, where we learned after our trip that one of the numerous waterfalls we had encountered happened to be the allegedly sixth highest waterfall in the world in Vinnufossen! 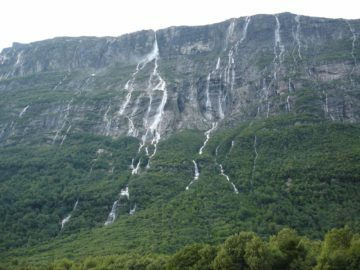 Plus, we also were blown away by the surreal beauty of Eikesdalen and its many waterfalls after visiting perhaps one of Norway’s most legitimately tall waterfalls in Mardalsfossen. 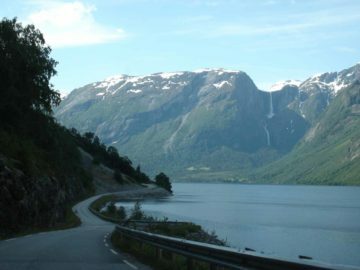 Møre og Romsdal County also had its own famous serpentine road at Trollstigen, which scaled a once impassable wall between two waterfalls named Stigfossen and Tverrdalsfossen. 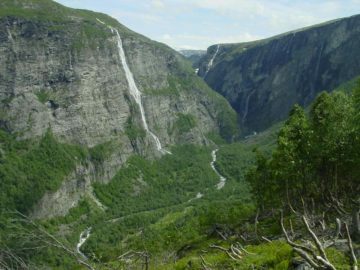 Then, we even saw the convergence of three or four major rivers at the hamlet of Åmotan, where we also saw three major waterfalls in close proximity to each other in Svøufossen and Reppdalsfossen as well as the surprising Linndalsfossen. 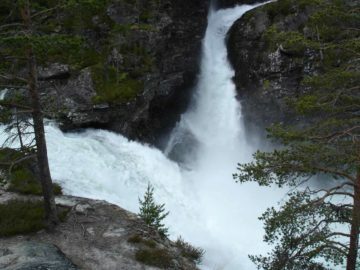 And we even went a little off the beaten path into the Trollheimen Mountains where we visited the waterfall Nauståfossen.